1 Neon + Resin, follow me at Design Debate, where I blog my inspiration 2 Gucci’s Bowie tribute 3 Paper cup perfection from Liberty 4 Retro design all stacked up 5 Business card tape, nice! 6 Gorgeous decay 7 That frock 8 The colour palettes of Wes Anderson. It all filters into my work. 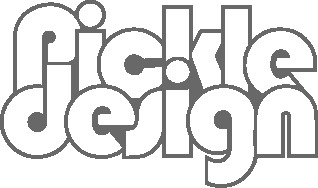 See more of what catches my eye at Pickle Facebook, Pinterest, and Design Debate.